Because music festivals aren’t the only festivals. One of the best parts about living in a major metropolitan area is that it’s really hard to be bored, especially in the summer. Every week, it seems, there’s a restaurant opening, a must-see art exhibit, a movie in the park. And every weekend, there’s some kind of local festival. I love local festivals – I love the opportunity to explore new neighborhoods, to support local businesses and artists, and to try new things. Also, local festivals are way less of a commitment than traveling for a festival – about one day of festivities is normally all I can handle! And, of course, they’re a chance to see and be seen – I get plenty of outfit inspo from peeping what other festival-goers are wearing. Whether it’s a posh food festival or a fun and funky art fair, festivals are a great chance to dress up a little and experiment with your look. Here are some fun outfits for local festivals to try, sure to impress no matter what your city has to offer this summer. There is huge local art scene where I live, and I love scoping out these arts and crafts festivals not just to grab some artsy prints for my gallery wall but to get some major outfit inspo. Whether they’re creatively layering prints, pairing unexpected colors, or rocking bold statement pieces, artsy people almost always have amazing style. To keep up with the cool kids, try pairing a few trends from this summer in unexpected but familiar ways, like a white off-the-shoulder top worn underneath a denim bib dress. The floral embroidery on the dress plays nicely with a bright floral fanny pack, which keeps you hands-free while you’re browsing booths. 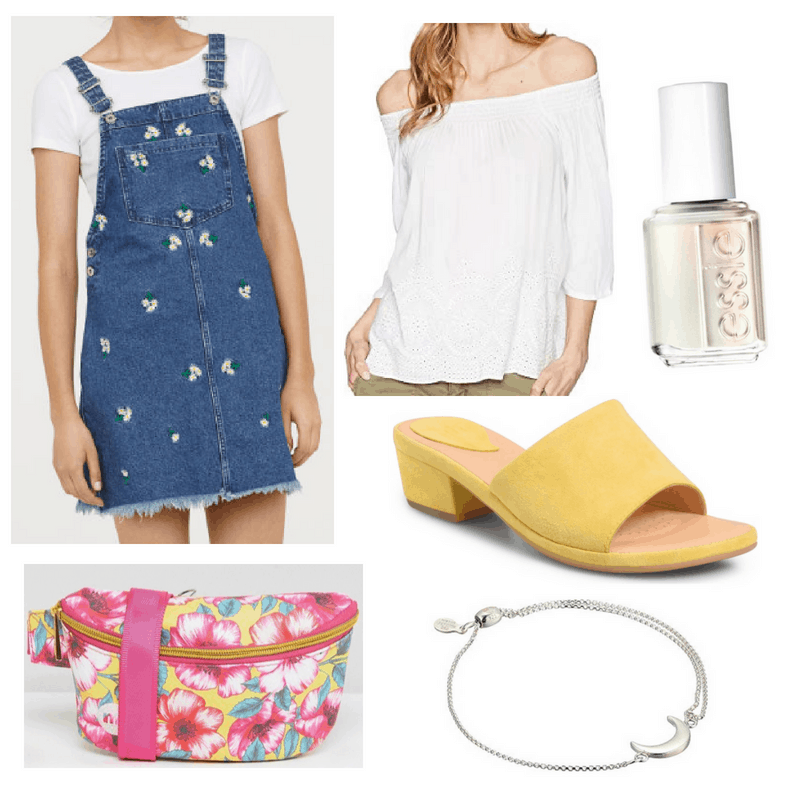 Some pretty yellow slides add a grown-up touch to the look, while pearlescent nail polish and a moon charm bracelet give the outfit an endearing but modern throwback vibe. Whether it’s a super-fancy wine pairing festival or a down-home bbq fest, a food festival necessitates a look that serves but is also roomy – for your inevitable food baby, naturally. Cue the jumpsuit! I love the jumpsuits that are everywhere this summer – they’re flowy and roomy but fierce af, and they make for no-brainer dressing. Just add some sleek neutral accessories, like strappy cognac sandals and a crossbody bag, and you’ve got a functional look that’s polished and sophisticated but also suuuper comfy. A trendy chain belt will give a floaty jumpsuit like the one shown above a little more shape (you can always take it off if you overindulge). Throw on your favorite necklace (or layer up some of your favs), spritz some texturing spray in your hair, put on a little bronzer, and you’re ready to chow down in style. I live in Michigan where a ton of fruit and produce is grown, and nearly every week it seems there’s a festival celebrating the peak season for those fruits – the cherry festival, the blueberry festival, the lavender festival, you name it. These are some of my favorite summer festivals. They’re always filled with interesting products and vendors, fun events, and, of course, delicious food. The downside – they’re often at farms or fairgrounds, so comfortable clothes and supportive shoes are a must. For your local harvest festival, try pairing a super femme summer blue off-the-shoulder dress with a pair of floral sneakers and a cute peach colored backpack. A cute pair of enamel fruit earrings (preferably in the shape of the delicious treat you are celebrating) and a swipe of a peachy lipstick add a youthful and fun element. Finally, don’t forget a cute pair of sunnies – go for a blush or rose-gold pair for a last little girly touch. What are your favorite local festivals where you live? What do you wear to those local festivals? What do you think of these looks? Let me know in the comments below!